how does this unique environment provide opportunities for change within and through sport? Sport writing in mainstream media has been exclusively dominated by Results and Business and Media reporting; reducing social, political and cultural aspects of sport to sporadic reflective exceptions. Academic writing on the other hand has not been accessible beyond the niche of expert journals that rarely feed into practice. What are the economic and cultural conditions that limit these two forms of commentary and how can both journalism and academia support access to insightful, engaged and participatory sport writing? Can an exchange be facilitated to stimulate critical and mindful writing on conditions and developments of contemporary sport? Young LGBT people remain some of the most excluded from sport in Western Europe, where improvements in LGBT human rights have not necessarily been matched by changes in heteronormative, and often, sexist sports culture. Meanwhile, the age of 'coming out' in these countries can be as low as fourteen; leaving LGBT young people vulnerable to homophobic & transphobic bullying in both school & community sport. Meanwhile, some of the youngest LGBT athletes participating in EuroGames and other LGBT tournaments are from Central and Eastern Europe. What are the consequences of exclusion for young LGBT people? What is its impact on the performance of those who choose to remain in sport? What are the safeguarding issues for young LGBT people in sport? How can we use sport as a medium for young people to challenge homophobia and transphobia? 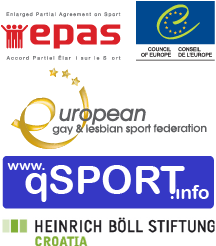 Due to its social and political components LGBT Sports organisation tends to be a complex task. From networking and outreach, to capacity building and sustainability, clubs and individuals need to continuously balance capacities and resources, public and private, local and international involvement. This workshop provides the opportunity for participants to discuss concepts such as pro-active outreach, capacity building and networking, marketing, event management and professionalisation. Contemporary sport is gradually becoming more inclusive through the efforts of those who have been previously marginalised. Although success has been by no means universal. Women for example, who represent 51% of the population, are less present, visible and established in sport than their male counterparts and the same can be said of those from minority ethnic backgrounds and disabled people. When does the absence of diversity in sport become evident? Can understanding of the cultural, social, and economic context provide a basis for better understanding? What is the business case for diversity and inclusion in sport? How do we truly engage communities when representation at governance level is at best nominal? How do excluded groups work together? Is it possible to form a united sports movement across all groups? What role do public authorities have in ensuring the broadest diversity possible in sport? How can this be achieved? LGBT inclusion from grass roots to elite sport requires a strategic approach across all areas - youth & community engagement, player & performance development, regulation, spectators & fans, PR & communications. This workshop will draw on two examples of good institutional practice from the Rugby Football League (RFL) in the UK and the Norwegian Olympic Committee. It will also enable participants to discuss key issues for integrating inclusive practice into their own areas of work, methods for climate change within institutions and strategies for consultation with those groups deemed ‘hard to reach’. The current LGBT sports movement can be seen as a triumph of self-organisation in the face of exclusion. For more than 30 years, gay men (predominantly) in Western European cities have created their own means of sports engagement and competition, whilst they have remained excluded from the mainstream. Are these opportunities enough however? Are they still relevant in 2012? Do they reach out to young LGBTs and do they embrace all sections of the LGBT community - women, transgender people, and disabled LGBT people? How can this ‘sports community’ meet the needs of those in countries where LGBT human rights do not exist? How can LGBT sport again become a vital and energetic movement that instigates progressive change in community and wider society? Can LGBT sport projects support other movements, struggles and causes in an innovative way?